The advancement of technology is revolutionizing the way business is done and how we communicate within the workplace. Successful organizations are constantly looking for the most effective and efficient ways to communicate with, as well as educate their employees. The eBook Transform Your Video Learning Strategy provides insights on how video has as emerged as the solution for learning and enterprise-wide communication. Video is undeniably powerful because, like email, it can be used across all departments of the company. We sat down with Tom Clancy, former Chief Learning Officer of EMC and Executive Advisor to Content Raven, to discuss the role of video in the future of enterprise learning and communication. If your company is looking for a new effective way to communicate, stop typing and start recording. A blended learning platform with video is key to support next-generation corporate training and communication. Video platforms are the way of the future and can provide in-depth security, customization, analytics, and a seamless integration into existing systems. By adopting a secure, user-friendly platform, organizations can save significant funds while providing their employees and customers with the most effective and enjoyable learning experience. Let us see how the eBook Transform Your Video Learning Strategy can help you with that. How Will This eBook Help You Understand How Video Is The Solution For Enterprise-Wide Communication? Businesses are starting to understand and recognize the massive impact video provides. In addition to being cost effective, its global scalability, self-paced learning capability, and time to market, video training creates a platform for employees to relate, collaborate, and share knowledge. 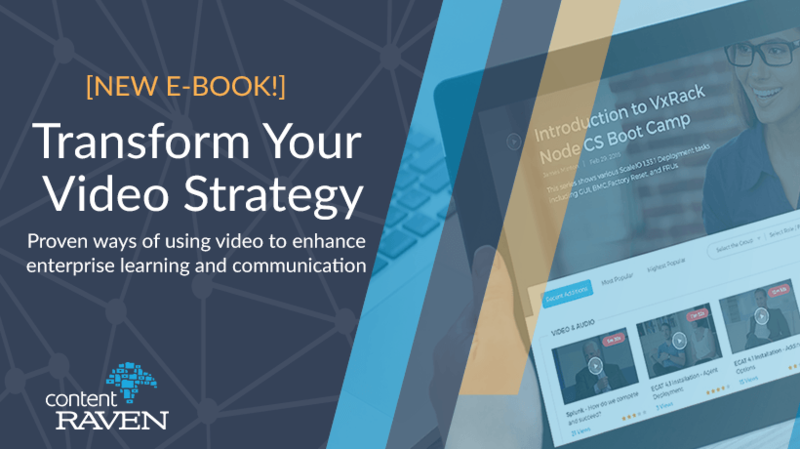 The eBook Transform Your Video Learning Strategy will explore the benefits and best practices of video as a key part of an effective business strategy. Benefits of implementing a video platform. Best practices for creating the most impactful video program for your employees, partners, and customers. Necessary features for building a successful platform. Download the free eBook Transform Your Video Learning Strategy and use these tips to design and develop an effective video learning platform.